After a spring of November-like weather, the sunshine gods smiled on us. An almost perfect day (a perfect day would have seen my partner and I set a record time and win that “little man”). Water levels were good – not too fast as to be a danger to the less experienced – but quick enough for excellent finish times. In fact, the last boat was off the water almost an hour sooner than some other years. No dams to portage, few, if any, spots to scrape the bottom of your boat. A gentle breeze kept us from getting overheated. After the race, there was good music and good food and the good fellowship of fellow paddlers– a good day for a picnic (and I especially enjoyed my friend Steve’s turkey – he is a master turkey chef). Each year, we support an organization in some charitable endeavor that has to do with the river or with paddling. This year, over $300 was raised by our participants for the Chicago Voyageurs, an organization that helps at-risk youth with outdoor adventures. We also invited some of the boys to paddle the minithon (no cost to them, of course) with their sponsors. Robert Hartman of Holland, MI, had the fastest time – 2 hours 5 minutes in the Unlimited Kayak division, followed by Kiril Floriv of Countryside, IL, in kayak in the Open division, with a time of 2:14. Fastest canoe was the team of Mark Koenig, Woodstock, IL, and Fritz Hansen, Burlington, WI, with a time of 2:22, followed by Neil Weisner-Hanks and Beth Schlueter, Oconomowoc, WI, at 2:24. Mike Brumbaugh of Roseville, MN, finished the SUP in 2:47. Ages – the oldest was listed as 127 and the youngest as 1 – I don’t think the 1-year-old paddled and the 127-year-old only felt like it after the race. There were at least five paddlers in their 80s who finished the race, with James Des Jardins the eldest at 86. Eric Luth made his annual pilgrimage from Arizona, the furthest traveler. Thanks to everyone who helped put on this event. The committee who met every month putting things together, the start line chair and his volunteers, the finish line volunteers, The RACES who supplied us with radio communications and spotters along the river, the Cook County and Lake County Forest Preserves for all their help. But I want to recognize Everett Andrus and Eric Velasco who sat out in the hot sun all day spotting boats at the finish line. Maybe the toughest job of the day. THANKS TO EVERYONE – SEE YOU AT NUMBER 60 in 2017: Sunday May 21. It took a while, but the Kankakee has been named a National Waterway. The process started about 10,000 years ago when the melting glacier broke through the moraines holding it back from Lake Erie (wasn’t called Lake Erie then). A wall of water surged forward, carving out a wide valley and leaving a great wetland. The wetland attacked many forms of wildlife – called by some the “Everglades of the North.” Through this wetland flowed a river. The natives called it the Aukiki or Theatiki or Kankakee. The river flowed through Indiana and Illinois. A beautiful stream, clear water. In the 1600’s and 1700’s, Voyageurs used the river as a highway. LaSalle and Tonti used this river as a main route between Montreal and Mackinaw Island to the Illinois River. A short, flat portage at South Bend the only obstacle, it would have been a national waterway, but we had no nation. Later in Indiana, it would become a hunting favorite for Presidents and dignitaries from Europe. In Illinois, the backwaters housed bank robbers and horse thieves. Now, another 100 years later, the Kankakee River has been named a National Waterway. Most of the channelized portions in Indiana have been taken over by nature. Wooded banks, beaver, fish, deer and a good river to paddle. In Illinois, where the river was not channelized, there are more bends, and a faster current. Unlike some major rivers, the Kankakee does not flow through many major urban areas, so it is often tree lined and natural. I have paddled sections of the Kankakee in Indiana and the length of the river in Illinois. Fun, scenic with public access points close enough to make a pleasant trip. As the river flows into Illinois, the current increases. Immediately, the river bends and curves. My favorite section is above Momence. A paddle to the state line and back might take three hours – but if you start at the state line (car shuttle), it is a fast, good trip. The river meanders and bends, and sand bars at the bends will take up ½ the river. Read the river and enjoy. The most popular section is from Bird Park in Kankakee to Warner Bridge, Kankakee State Park. Canoes, tubers float past. Some river reading will keep your feet dry. Neat island and sandstone cliffs along the way. You can paddle the whole length of the river in both Indiana and Illinois. There are frequent public access sites. CAUTION: Some laws you should observe. The Kankakee meets the Des Plaines at Dresden, and becomes the Illinois River. Shortly after we started canoe racing, my friend Dave (Peanut Butter) heard about a race on the Kankakee in Indiana. No racing canoes. We brought our Sawyer Cruiser and immediately saw that we were in a different class than most of the boats. Aluminum canoes with young men in their late teens and early twenties were our competition. A local “Boys” club had bought a voyageur canoe and were hoping to raise some money to pay off the purchase. The young men were either part of the club or alumni. A la mans start – run across the parking lot – left us way behind. Shortly after the start, a boat dumped. We helped them and their canoe to shore, paddled downstream, and returned with their paddles. And within twenty minutes or so, we had passed everyone. We were actually embarrassed, but apparently the spectators were not. At each bridge, spectators asked my wife, our pit crew, if the “old men” had come by yet (we were in our 40s). We would wait around bends for the other canoes so we did not finish too far ahead. The finish was under a bridge on a rural road. A flat grassy area at the take-out. 1st place was a cash prize – $100. I took it, gave it to Dave, who counted it and gave it to the race sponsor. BUT – THAT IS NOT THE END OF THE STORY. Several years later, there was a re-enactment at the Kankakee Marsh County Park. Things had changed – that rural road and grassy spot was now a nice county spot in the restored wetlands. Way to go, Indiana! I saw a Park Ranger – a young man. “Years ago, there was a race on the river that ended here. Do they still have the race?” I asked. And I felt good, not that he recognized me, but that one of the boys was now working as a park ranger to help preserve the river and wetlands, and that the state and county were working to preserve the area for the future. Sauk Valley Race on the Rock River a few years ago. The water was up and the current was flowing rapidly. My partner Tom and I looked over the competition. We might beat some of them, some of them might beat us. That is part of the fun of racing. Then we spotted my friend Ed. He has been my nemesis for years (except when we are paddling together, then he still finishes ahead of me because he paddles in the bow). Been trying to beat him for years. He is a couple months older than me and has a better looking beard which makes me jealous. Ed would be paddling with Linda. This should be a good race. Linda was probably the best woman paddler in Illinois at the time. I forgot about the other boats in the race – this could be fun. Deep water – should be an advantage for us. Tom weighed about a quarter of a ton – well not quite that much, but he was big and strong. Ed was a lightweight and Linda probably never saw the 100 mark on a scale. The Rock had a series of curves and bends just after the start line. The advantage of deep water vanished as Ed and Linda were able to cut the corners. If we followed, we were no longer in deep water and they had the advantage. If we stayed in the deep water, we were traveling further and they had they advantage. First third of the race, they were out ahead of us – minute or maybe more. Next third of the race, we were staying about the same distance behind them. As I threw the paddle from one hand to the other, the wind caught it – or I just plain missed it. Paddle went flying — DRAT (or words to that effect). “No!” I yelled. “Someone behind us will get it.” I reached for the spare paddle. We were gaining. We could get them! Closer, closer. We were on their wake! Around the island and upstream about a block to the finish line. Our bow was past their stern. Couple hundred yards to go. We were on the inside, slightly less current. We were pushing as hard as we could – but so were they. They cut over to the other shore as we stayed along the island. We were lucky. We inched ahead and sprinted as hard as we could. Black paddle – dark water – wide river. I just threw away $250 (cost of the paddle). WAS IT WORTH IT TO BEAT ED? YES!!! 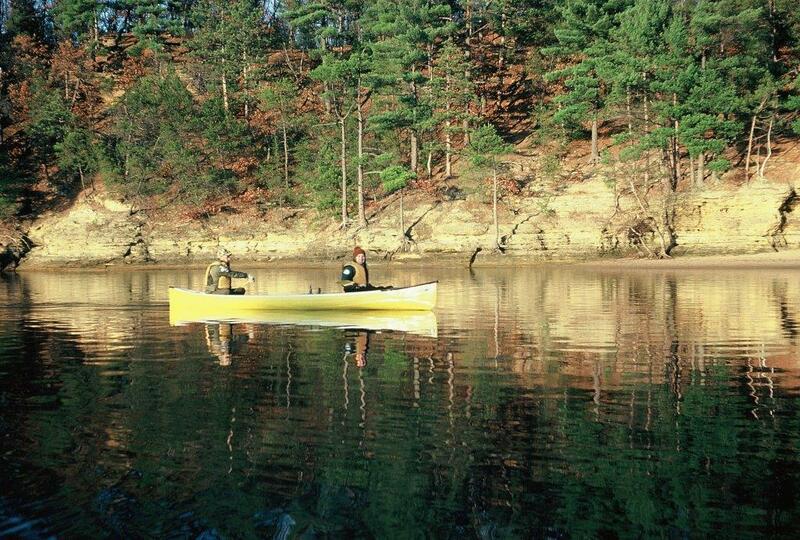 Epilogue – Ray spotted the paddle floating down past us – jumped into the water to give it CPR – Canoe Paddle Rescue. Ed took the paddle home with him and returned it to me the next week. Embossed on the paddle were my name and address. Good sportsmanship, or was he rubbing it in that I was a clod – whatever – I appreciated it. Thanks Ed. No other sport offers so many varieties on the same theme as paddlesport. Paddling, for many people, is CANOEING – you sit in a canoe, look straight ahead, paddle from point A to B. If you are a novice, your arms will feel like a ton in 20 minutes. Or, for the more adventuresome, there is WHITEWATER in which a bunch of crazy lunatics risk their life hanging upside down in kayaks in rapids no sane person would want to be in! There is truth in both statements, but there is so much more! No other sport offers so many different options of craft, places to take it and activities. But there is even more – namely, the realization that paddlesport offers a unique opportunity towards educational enrichment. CANOEING – You can take a canoe on a local river for a leisurely trip, to go fishing, or to just enjoy the natural environment. Of course, you can also use the same canoe to help clean up the trash along a river bank, or to give a youngster a first taste of outdoor “adventure.” You can use your canoe as a means of transportation to get to places otherwise inaccessible and take it CANOE TRIPPING into the wilderness for a week or more of camping along the shores of lakes or rivers. Change the dimensions of the canoe; make it narrower and longer, put some power drink in a backpack and you can start competing in MARATHON races, from 10 to 100 and more miles, depending on your stamina. Or change the dimensions even more, until the canoe looks more like an arrow, and you’re ready to SPRINT – an Olympic discipline for many decades. If you don’t like to paddle by yourself, make the canoe bigger and put more seats into it, and you’ve got a long boat. There is power in numbers – and 15 to 20 or more people paddling in unison can make even a 30 foot boat fly! You can now recreate history in a VOYAGEUR CANOE or experience culture from faraway places in a CHINESE DRAGON BOAT. The voyageurs played a very important role in the development of the North American Continent, and various RENDEZVOUS throughout the region annually recreate these historical moments. Garbed in traditional voyageur clothing, singing French-inspired songs, paddlesport is a way to honor the past. KAYAKING – Do you want to give the double-blade a try? There are many choices, too – touring or sea kayaks, white water or sprint boats, and too often, the short and wide rec boats – it’s all a matter of personal preference. SEA or TOURING KAYAKS can hold a great deal of gear. They are designed to track well in wind and thus are ideal for open bodies of water, for exploring sea caves in Lake Superior, or, as many members of local sea kayak clubs prove regularly, just to get out on Lake Michigan and paddle for a few hours! Your choice in sea kayaks is as large as in canoes – from traditional Eskimo style skin and frame boats, to the high tech Kevlar and carbon fiber lay-ups – each offers features not found in the other – so try as many as you can until you find the one that’s right for you and your budget. You say, the sea kayak didn’t turn fast enough! 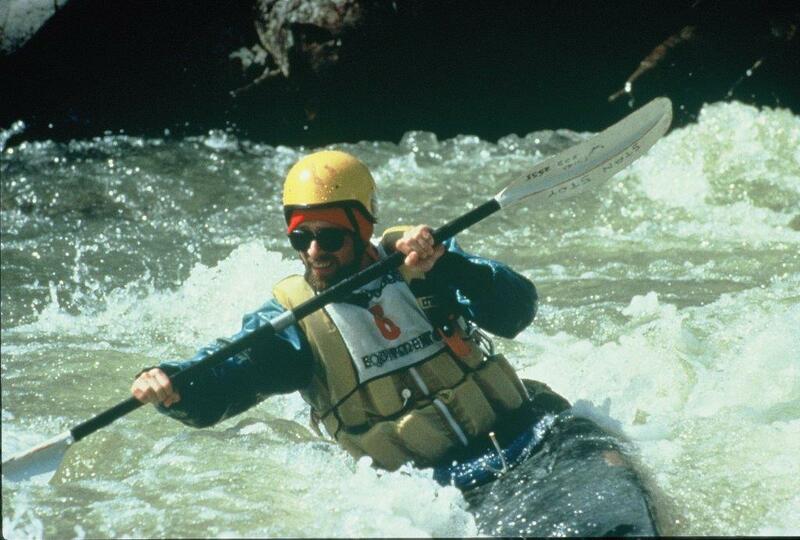 Try a WHITEWATER KAYAK instead which is designed to pivot on a dime for the quick maneuvers necessary in rapids. You say they don’t go fast enough! Then challenge yourself in either a downriver racing or flat-water sprint kayak, either will surely increase your sense of balance if you give the boats a chance! KAYAKS too are versatile: for the top athletes, Olympic participation is the ultimate reward. For the adventurer, there may be a first descent in spectacular surroundings; or for the nature lover, a weekend get-away in Wisconsin. Several times I have seen a bald eagle swoop just 10-15 feet ahead of me. But equally important, there is also the camaraderie with friends who enjoy all with equal intensity. And if you don’t like sitting in a canoe or kayak – try the latest iteration of paddling – the STAND-UP-PADDLEBOARD; whether to get a good core workout, or to develop your balance in SUP Yoga, it is one more variety on the paddling theme. If you think we have covered it all – here is more. Paddlesport is not only for the able bodied person, but for PEOPLE WITH DISABILITIES as well. Just think about it: once in a boat, you really do not need your legs very much – so a person with a lower limb disability can enjoy the same freedom of movement as you and I. There are ALSO paddling clubs whose members are breast cancer survivors and found that paddling together provides not only physical but emotional benefits as well. Is paddling only for the young? Of course not – it’s a LIFETIME ACTIVITY – I’ve seen kids as young as five in a solo kayak, or infants with parents in a canoe (be sure you have good paddling skills if you bring the baby!). I also know plenty of paddler grandparents, this author included. But there is one more aspect of paddlesport which I believe has not been exploited as much as it should: paddling as a catalyst for a more integrated approach towards OUTDOOR EDUCATION with a focus on our natural environment. I fear we are raising a generation of very computer-literate youngsters, to whom nature is a virtual reality, on-screen/DVD experience and playgrounds are carefully controlled aseptic indoor environments! A paddling trip is unlike any other outdoor activity: it is not a setting prescribed by humans like a playground. There is no paved hiking path leading from parking lot to picnic site. There could be a natural obstacle, like a downed tree, or icky stuff like mud, worms or mosquitoes. Maybe the youngsters will see death, a fish floating belly up or a bird tangled in a fishing line whose lure still hangs glittering from a branch. Or they’ll see shopping carts, tires, and picnic tables in the water. But chances are they can also see a deer, muskrat, beaver dams, and herons, catch their own first fish and learn to appreciate the beauty of nature, and hopefully, will want to protect this environment. As I used to tell my students – you won’t protect what you don’t love, and you cannot love what you don’t know – so get to know the beauty of nature through paddling. This is the third article in a series of how paddlesport – in this case rowing – is helping people with special needs. 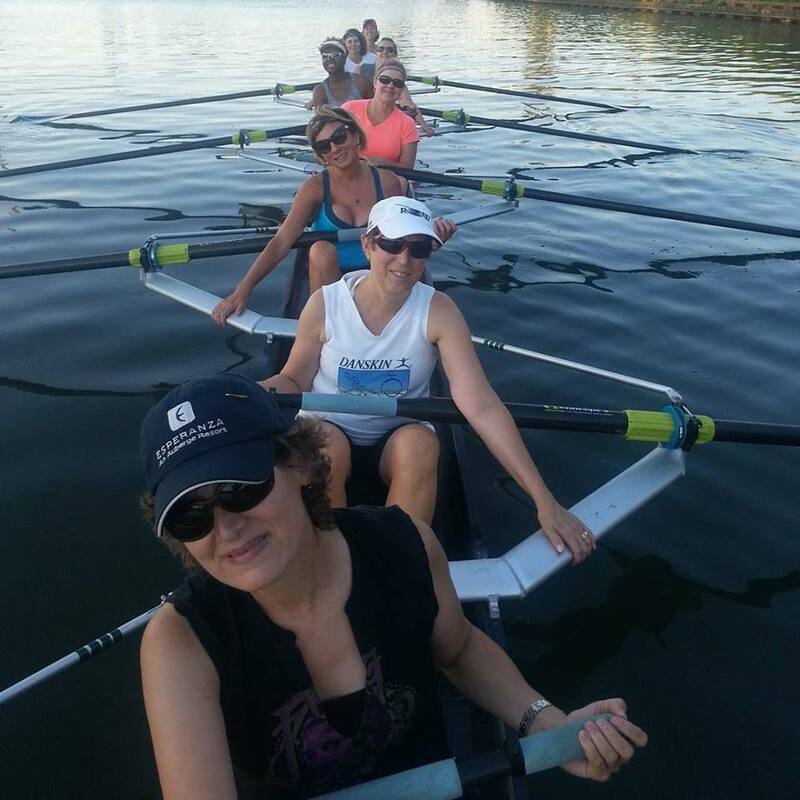 Recovery on Water (ROW) is a rowing team that gives survivors of breast cancer the unique opportunity to interact, become active in their recovery, and gain support from fellow survivors. ROW provides exercise programs for survivors six days a week in rowing shells on the Chicago River during the spring, summer and fall, and on indoor rowing machines during the winter months. Regular exercise has been shown to reduce cancer recurrence in patients treated for breast cancer by up to 50%. 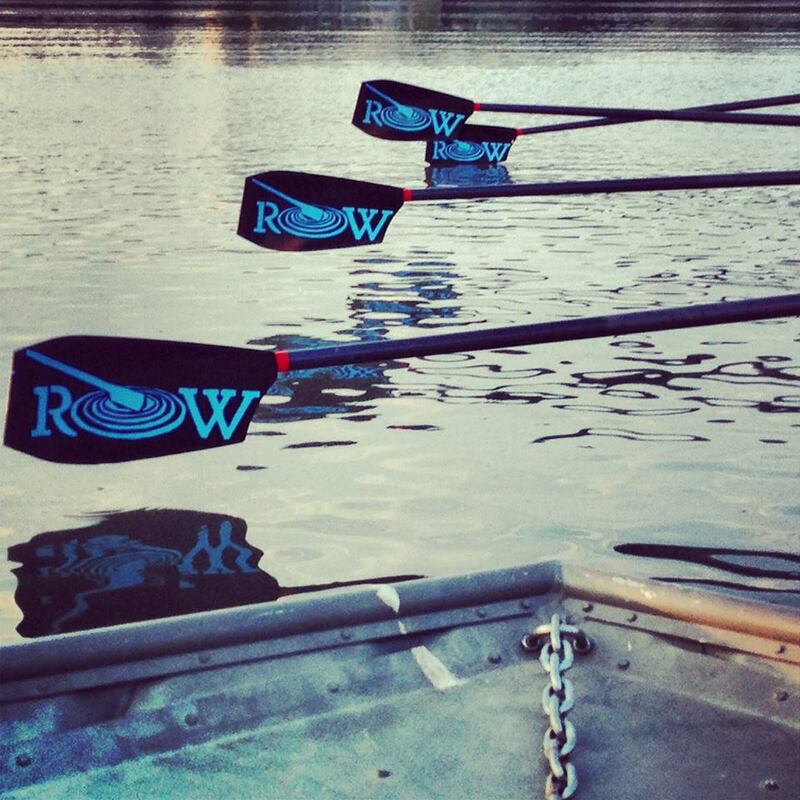 ROW was started in 2008 and currently has over 60 members. As dragon boating slowly continues to gain popularity throughout the US, a local Illinois team is taking the world by storm. 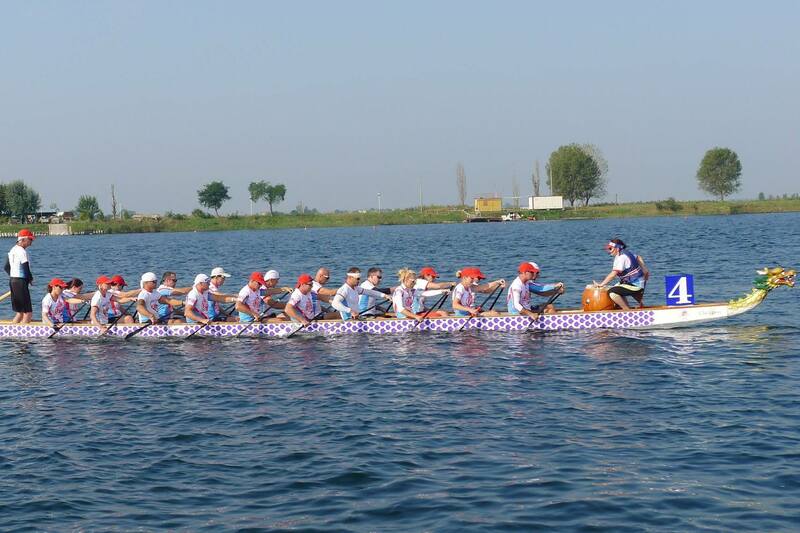 The Windy City Dragon Boat Club (WCDBC), based in Arlington Heights, IL (a NW suburb of Chicago), recently competed at the Dragon Boat Club Crew World Championships in Ravenna, Italy. 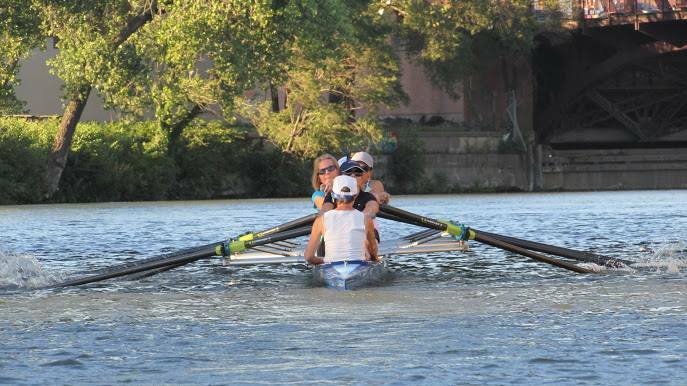 After earning the berth to compete by winning the 2013 Club Crew Nationals in New Jersey, the team traveled to Italy in October of 2014 to go up against some of the toughest teams in the World (the competition drew over 130 club crews from 27 countries)! The Windy City Dragons competed in three (3) distances (200m, 500m and 2k), in three (3) different divisions. In the end, they took home two (2) GOLD medals in the Senior A Mens division, a bronze in Senior A Mixed, and a bronze in Premier Mixed. Needless to say, the team was extremely proud of their accolades and even prouder to represent the USA on a world stage. Since that time, they have been working hard in preparation for the next major competition, the 2015 Nationals, to be held on their home lake – Lake Arlington – July 25-26. If they do well (as expected), they will earn a berth to compete at next year’s World Championships in Australia! The Windy City Dragons practice 2-3 times per week as a team. (This is in addition to individual paddling sessions on outrigger canoes as well as strength and endurance training in the gym.) The WCDBC also competes in various festivals throughout the summer (e.g., St. Charles, Toronto, Madison, Chinatown and Milwaukee) to ensure that they are race-ready for Nationals and beyond. The club’s origins date back to 2009, when a group of individual paddlers from the Lincoln Park Boat Club, most with a long history of competitive paddling experience, came together as a team to compete at a local festival in St. Charles. 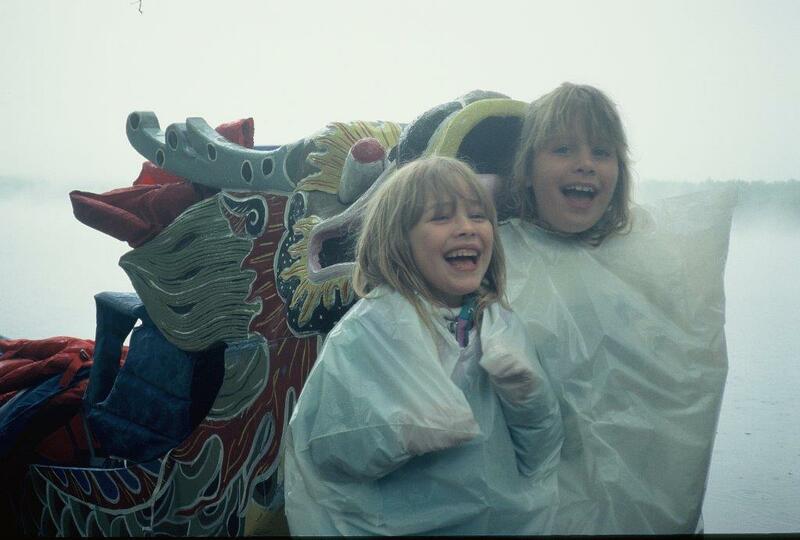 When they won that competition, it was clear that this was not going to be a one-time thing, and the first competitive Chicago-based dragon boat team was formed. Without a boat of their own, the team traveled to WI on a regular basis to practice with the Racine-based club, Arashi. In 2010, they joined forces with Arashi to compete in the Club Crew Nationals in Chatanooga, TN. 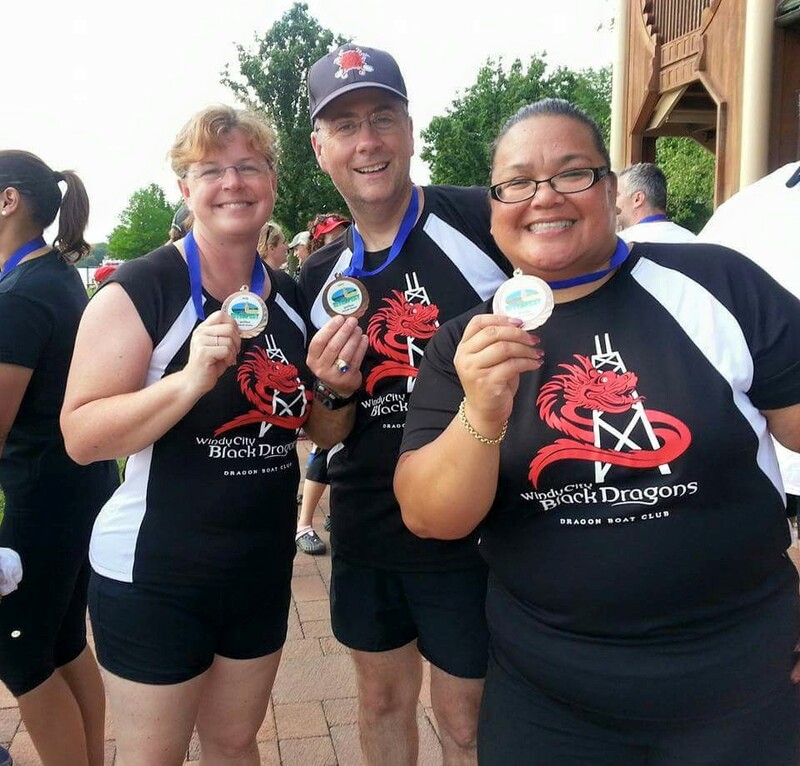 After winning that competition, team members pooled their own money to buy their first dragon boat, and the Windy City Dragon Boat Club (WCDBC) was born. Over the past few years, the team has grown and developed its roster to become a consistent threat – not only at local festivals, but in national and international competitions across the country and around the globe! In 2011, they competed in the Club Crew Nationals in Fort Dodge, Iowa (that year, the Nationals were switched to odd-numbered years) and won the bid to compete at the 2012 Club Crew Worlds in Hong Kong. In 2013, the WCDBC joined forces with the Iowa-based team, Solid Steel, to compete at Nationals in New Jersey as well as Worlds in Italy (2014). Today, the club has three full-fledged teams: The Windy City Dragons (elite competitive crew), the Windy City Black Dragons, and the Windy City Lady Dragons. They also work with local corporations (such as Grainger and United Airlines) and non-profits (such as Wounded Warriors) to help coach and ready their teams for festival competitions. Believe it or not, there’s more to the WCDBC than just winning races and collecting medals. Team members paddle for a variety of reasons, chief among them the 3 F’s (fitness, fun and friendship). There are few team sports that allow 22 people (20 paddlers, a drummer and a sternsman) to all be on the playing field (or in this case, the boat) at the same time! The team also encourages new or inexperienced paddlers to give dragon boating a try by offering two (2) free sessions (including personalized coaching) to anyone interested in paddling. Membership in the club is only required if a paddler decides to continue after the introductory sessions, so there’s nothing to lose! However, most new paddlers end up joining the club after their first experience on the water. It’s just that addicting . . .
For more information on the WCDBC, please check out their website at windycitydragons.com or send an email to windycitydragons@gmail.com to request your first free introductory session! The Illinois Paddling Council, affiliated with the United States Canoe Association (USCA) annually holds many events that qualify in its points program. USCA also has associated sister organizations in Michigan, Indiana, Iowa and other states, so once the “competitive” event bug bites you – you might just find yourself participating there as well and explore new rivers and make new friends. Competitive paddling is fun, builds strength, increases stamina, improves paddling skills, forges friendships, gets you on new rivers, earns trophies and awards and can lead to “fame” – but above all – participants have lots of fun! Check out the list of events on the IPC Events Calendar. If you’re not of a competitive nature – participate anyway – because you can have lots of fun even if you don’t win a trophy or medal. You’ll be surprised by the many new paddling friends you may make!